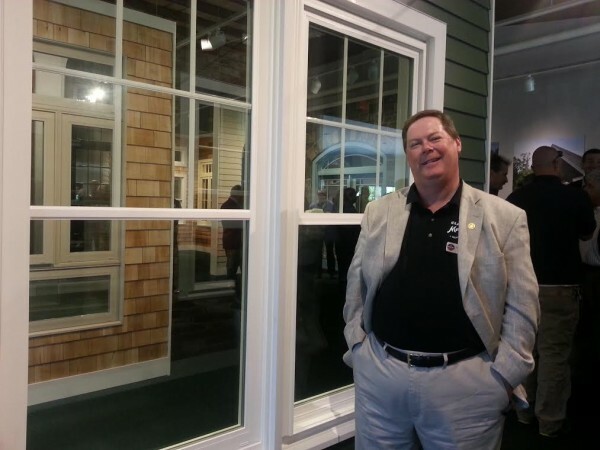 On Friday, Scott Hawthorne, president of Mathews Brothers manufacturing facility, stands in front of one of the large windows on display at the company's new Belfast showroom. BELFAST, Maine — For eight years, the Mathews Brothers facility in downtown Belfast has been empty, but on Friday, the company celebrated its brand-new use for the long-vacant space with pomp, circumstance — and a lot of beautiful windows. The 160-year-old window manufacturing firm, the oldest in the country, held a ribbon-cutting ceremony for the John G. and Janice H. Hawthorne Center on Spring Street, which will function as a showroom for the windows that continue to be made in a different part of the city. “The whole reason for doing this was to educate our customers about what we do,” Scott Hawthorne, company president, said Friday. Gov. Paul LePage and syndicated radio talk show host Howie Carr were keynote speakers at the morning ceremony, which drew more than 100 people. Crowds strolled around the spacious showroom, admiring the different models and sizes of windows for sale through the company’s dealers. His own eyes grew a little misty when he talked about his parents, for whom the refurbished facility is named. John Hawthorne, who joined Mathews Brothers in 1973 and became president in 1986, died in February after a battle with cancer. He was followed just days later by his wife of 56 years, Janice. John Hawthorne, who worked to expand the company into a manufacturing facility on Perkins Road in 1991, cared a lot about his employees, according to Belfast Mayor Walter Ash. He said that Mathews Brothers, which employs 130 people, is one of the most important companies in Belfast. Hawthorne said the company is continuing to innovate window design and its own corporate practices. They closed the downtown Belfast retail store in 2008, both because of the Great Recession and because other area dealers thought that it was too much competition. “We needed to focus on manufacturing,” Hawthorne said. So the company did. In addition to constructing their traditional wood-framed windows, the company offers products in “just about every area,” he said. The company fabricates composite vinyl windows, high energy efficient windows, custom wood windows and historic weight-and-chain windows. There also is something still in development that Hawthorne has called “the windows of the future.” Those are going to be made of vacuum-insulated glass, which are thinner than most windows because the vacuum seal keeps heat from escaping or entering. “When you thin out the window, the art comes back into it,” he said. While the Spring Street showroom will not be open to the public, it will be open to people by appointment through the company’s dealers, which include Viking, EBS and Crescent Lumber of Orrington.